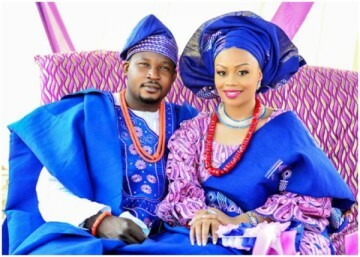 The Yoruba traditional marriage is a colourful ceremony with a lot of guest dressed in colourful attires known as ”Aso Ebi” there is a lot of feasting and merry making. The ceremony usually takes place in the late afternoon/evening in the bride’s family compound .The evening begins after all the invited guest have gathered. The event is kicked off when the groom and his family arrives .They are usually stopped by the older women from entering the compound(bride’s family house) demanding the groom and his escorts pay a fee. The grooms family now pays whatever amount they are asked in other to gain entrance . Once the groom and his family are in the compound ,the oldest Male from the groom’s family who has been appointed as their spokes person approaches the bride’s father informing him of their intention. Usually the request is not stated directly, the traditional phrase used is ” we have found a flower in this house that we wish to take home with us” then the brides father sends for the bride (two or three persons who are not the bride are presented as the requested bride but rejected by the grooms family) the bride is presented with a veil over her face, once the groom has identified her as the bride they seek,she in turn is now asked if she knows the groom and his family after she identifies them she is now taken back into the house. The bride is escorted by other young girls accompanied with singing and dancing the second time she comes out, She is dressed in the Yoruba traditional attire adorn with beads . The groom then presents the gifts he has brought for the bride along with the bride price (the gifts for the bride are usually items requested in a traditional marriage list given by the bride’s family to the groom). After the presentation of gifts and bride price, the bride’s parents say prayers blessing the marriage then the merriment continues through the evening as the couple dance and celebrate their union.